“Problem skin” is definitely what describes my skin best. If I’m not being plagued by acne, then I worry and fret over my unsightly sebaceous filaments, uneven skin tone, and dark spots (most of them being post-acne marks). There was a period in my life when my skin was at its prime, meaning it was mostly clear and all I had to do was deal with the occasional zit, but alas, that time has come and gone. So now I make do, continuously testing out various acne treatments and trying to keep my face as clean and moisturized as possible all the time and allowing my skin to breathe every now and then throughout the week by not wearing makeup. But of course, I still end up with multiple breakouts quite a bit and there’s nothing more frustrating than trying to cover up angry looking zits, especially if they’re in numbers! That’s why I decided to get Origins’ Out Of Trouble ($250HKD) mask after reading a lot of reviews on it really helping to calm down those red, angry blemishes and how it makes skin just feel so much better after. Product description: When skin is too-slick, or when more pressing problems start to pop up, it’s Origins to the rescue to keep skin out of trouble. Nature’s trouble-shooters, including super-absorbent Zinc Oxide and Sulfur, calming Camphor plus skin-sloughing, rapidly respond to problem skin’s plight with a three-part plan – sop up oily-shine, slough off sticky, dead cells, and sweep away irksome debris. Together they steer skin clear of slippery situations, refine rough texture and pull the plug on troublemakers to oust potential outbursts. 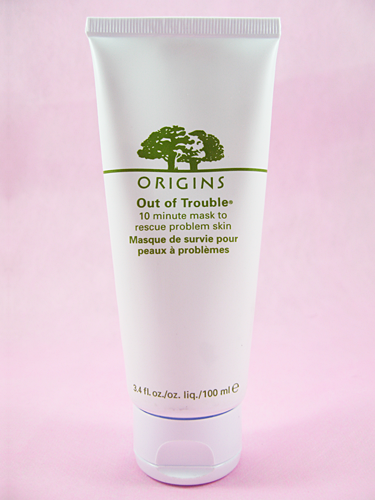 Origins Out of Trouble® is best for oily and combination skin. I like the simple and clean design of all of Origins’ products and this one is no exception. I’m also glad this comes in a convenient squeeze tube. I prefer my masks in squeeze tubes, sachets, and the like actually because it makes it easier to bring along with me so I can still pamper myself when I travel. You get about 3.4 fl. oz of product which should last you quite a while, but how quickly it’s consumed obviously depends on how often you use the mask and how much you use each time. Speaking of which, a recommendation on how often you should use the mask is surprisingly not given, so I guess it’s really up to you to determine when you feel like you need it or not. I, personally, use it just once a week. Twice at most. I think to use this everyday, like with most face masks, is excessive and will most likely do more harm than good to your skin. Since this is supposed to help remove or control excess shine, chances are you might dry out your skin if you use it too much. 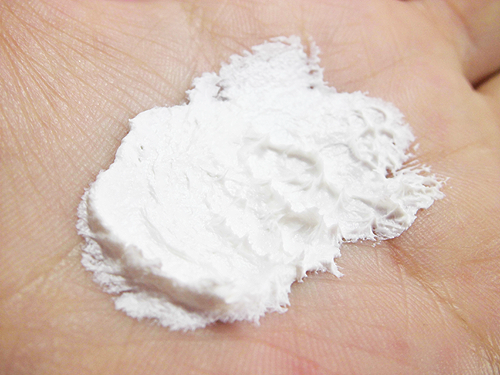 The consistency of the mask is thick, but it’s not difficult at all to apply and spread. What I’ve seen a lot of people complain about is the scent. Some have even stopped using the mask altogether because of it. It has this distinct medicinal smell to it that’s also partly herbal in a way. One reviewer on Sephora wrote the smell reminds her of Vicks Vaporub and it sort of does, but to be honest, I don’t mind the smell at all. Yes, it’s a little strong at first, but once you apply it on your face you don’t notice it that much anymore and it fades somewhat after a while. Origins says to leave this on for ten minutes, but to make doubly sure it does the job I leave it on for twenty. So far I haven’t experienced any negative effects from doing that. When time is up, use a damp washcloth to remove it. You can try rinsing it off, but that’ll just take forever. Using a washcloth is much easier and quicker, just make sure to use a gentle one! Immediately after I feel like my skin is cleaner and instantaneously refreshed. As if I hit reset button for my skin after a whole week. Does it calm down angry looking zits? Well, that depends. Sometimes it does, sometimes it doesn’t. I guess it depends on the stage of the acne and just how persistent they are. On occasion though I do notice some zits, particularly the smaller ones, appear less inflamed the next day after using the mask. For some reason I was expecting this to help control oil, but when I re-read the description I think they only meant it would soak up any present oil you have just prior to using the mask. The fact that my skin feels a little smoother after immediately using the mask too most likely means it really is ‘sloughing off sticky, dead cells’. So in summary, I do quite like this mask . I wish it helped consistently calm down my inflamed blemishes like it seems to do for other people who use it, but I’m not complaining here. The mask overall is a good way for me to de-stress my skin by the end of every week, and I really feel like it does the job of giving my skin that extra cleansing boost which is always a major plus for me. Will I re-purchase? If there was an Origins locally, I might do. But I don’t know if I’ll go through the trouble of ordering it online just yet because I feel there are other masks for me to try that will possibly work a little better for me. As of right now I’m road testing another mask which I’m already starting to like more, haha. 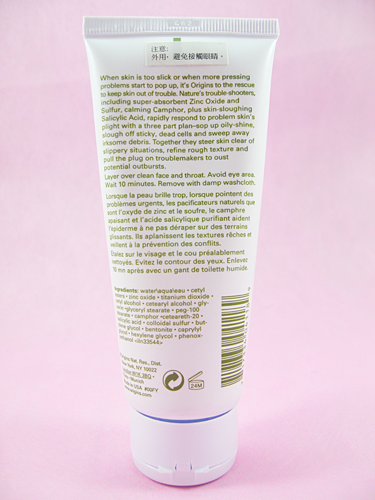 The travel-friendly and convenient squeeze tube packaging. Simple and clean looking packaging. Easy to apply and spread. Makes my skin feel both refreshed and cleaner after using. 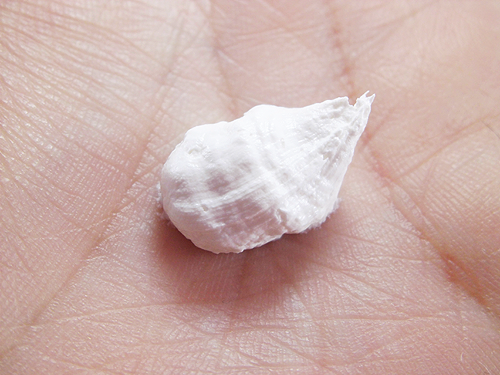 Calms down smaller, inflamed acne. I, personally, don’t mind the smell of the product but others may not like it. Especially if you’re sensitive to or really dislike scents that are medicinal or herbal-like.